We packed-up camp at Death Valley and headed east through Nevada & Utah, crossing back into the Mountain Time Zone. 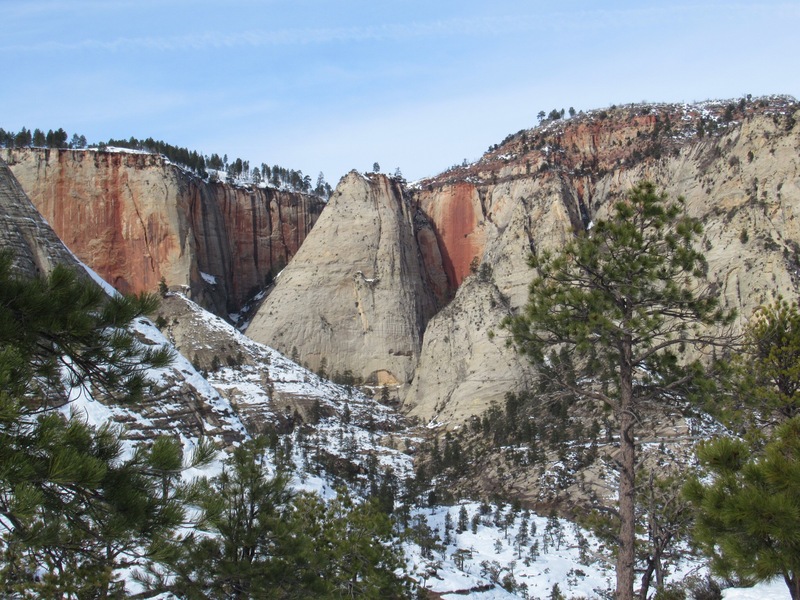 Even with a stop to resupply our food stores, we arrived at Zion National Park around 3pm. We found a nice campsite by the river, and settled in for the evening. The weather was much cooler than Death Valley, but comfortable in the 50s. We had hoped to go for a longer hike, but we didn’t bring our snowshoes to deal with the deeper snow in the higher elevations in the park. For lack of longer hikes in the low country, we settled for a few shorter hikes. 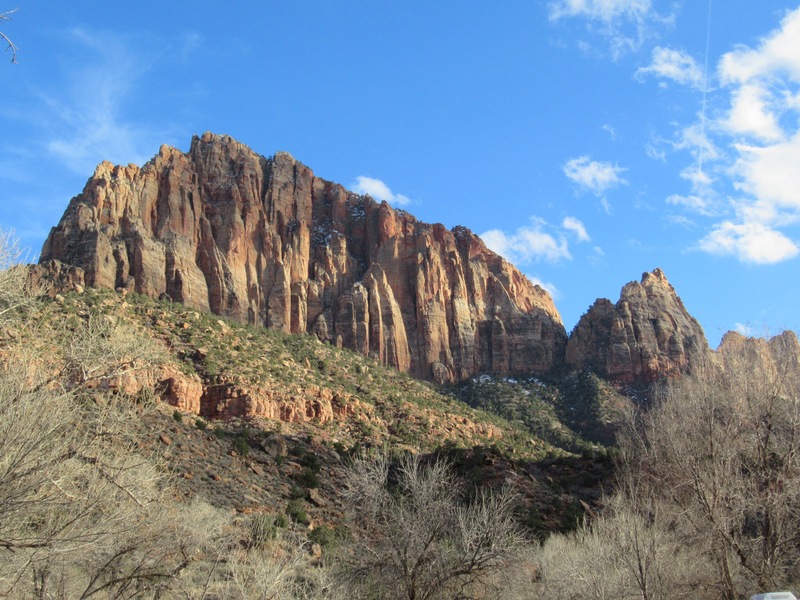 Although due to the beauty of Zion Canyon, it felt like we gained rather than lost. 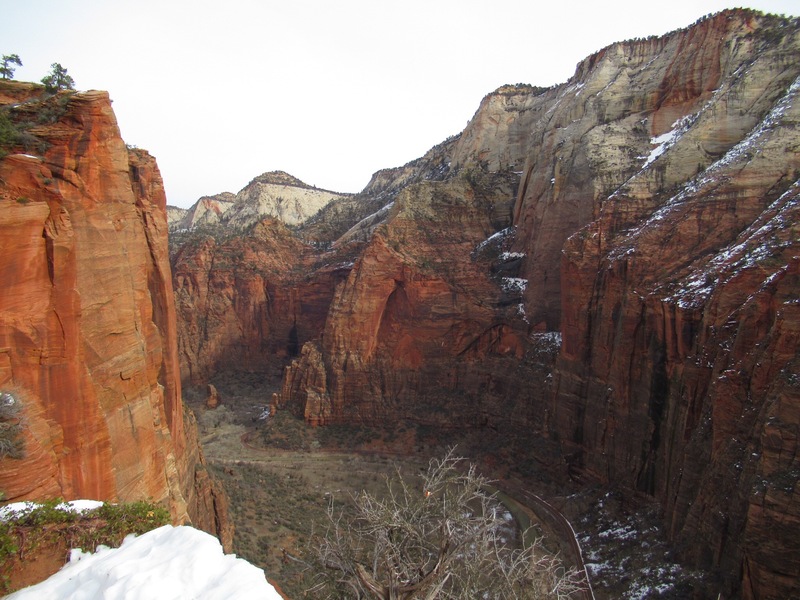 We started with a hike up to Angel’s Landing, which gives hikers a hawk eye’s view of the canyon. We made it a little over two miles to Scout Lookout, about half a mile from the landing and assessed our options. We had encountered some ice and packed snow on the way up, but nothing that our microspikes weren’t suited for. 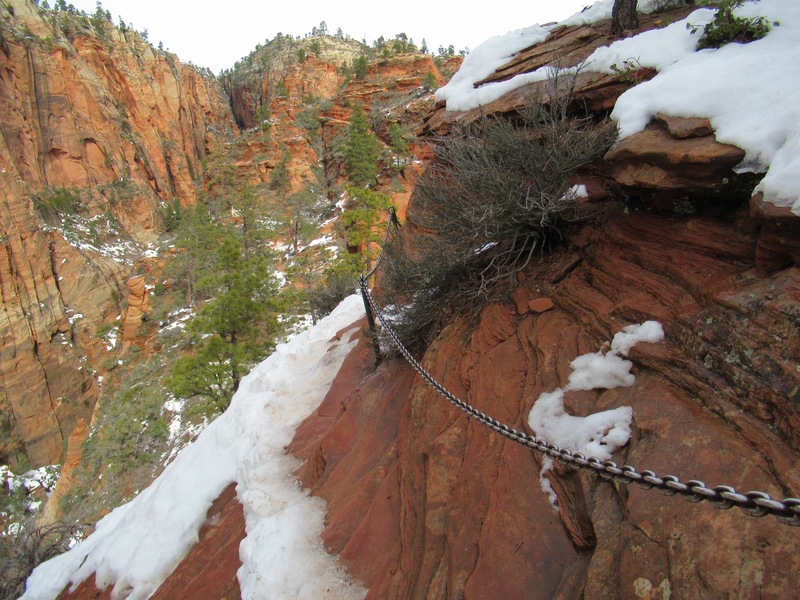 The rest of the way had chains for hikers to grab as a safety precaution against slipping and falling off the sheer cliffs surrounding the lookout. We attempted to go further, but after dealing with some sketchy sections due to ice not quite deep enough for our spikes to sink into, decided to turn around and not risk slipping. 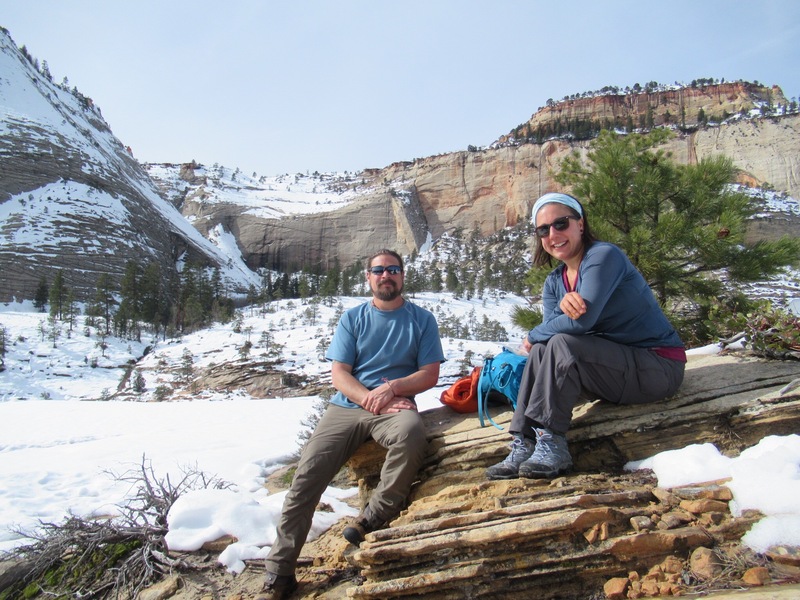 We hiked a little up the West Rim Trail and found a nice spot to eat lunch. It was a Sunday, so the trails were crowded, but going a bit further than the lookout offered us a quieter spot to take in the grandeur that surrounded us. 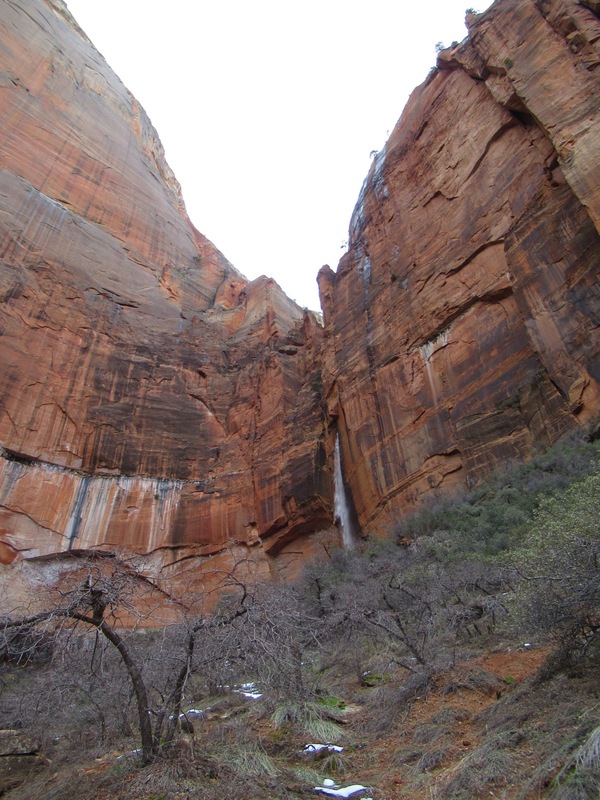 We hiked back into the canyon after lunch and ventured over to explore upper, middle, and lower Emerald Pools, which are filled by a waterfall from the lip of the canyon above. 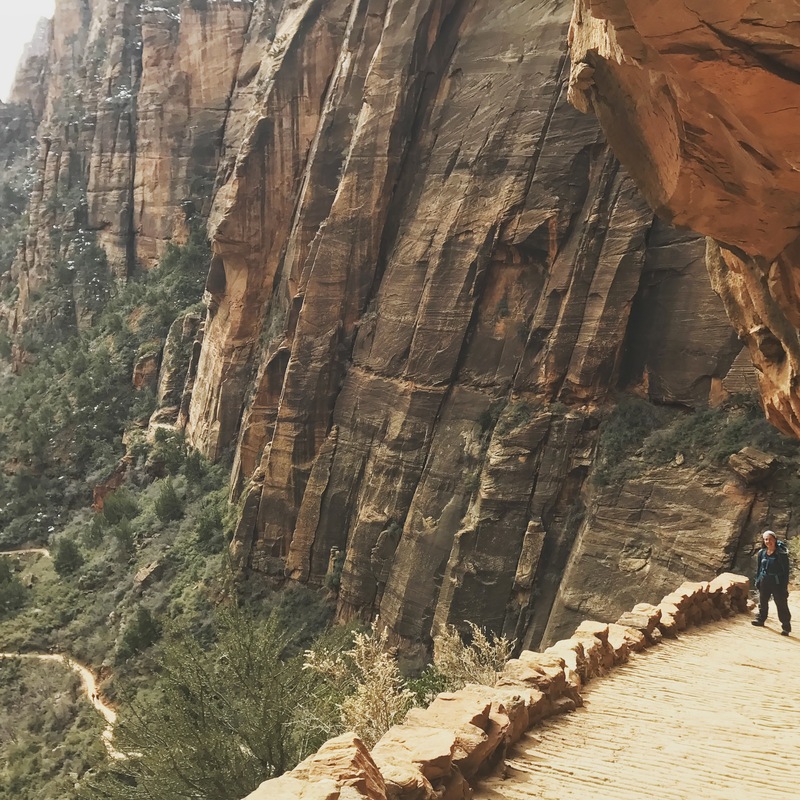 From there, we finished the six mile drive to the end of the canyon and ventured-up the trail paralleling the river to peer into The Narrows, named appropriately as the canyon becomes quite narrow (twenty feet wide in some places) for many miles. It’s a popular hiking route in the summer, when the temperature is hot, the water level is lower, and one can wade up the river. This time of year the hike requires dry suits to stay warm and dry in the ice cold water. Something left to be explored for hopefully another trip to Zion! Our three hikes took up most of the day, and we returned to our campsite for the evening. 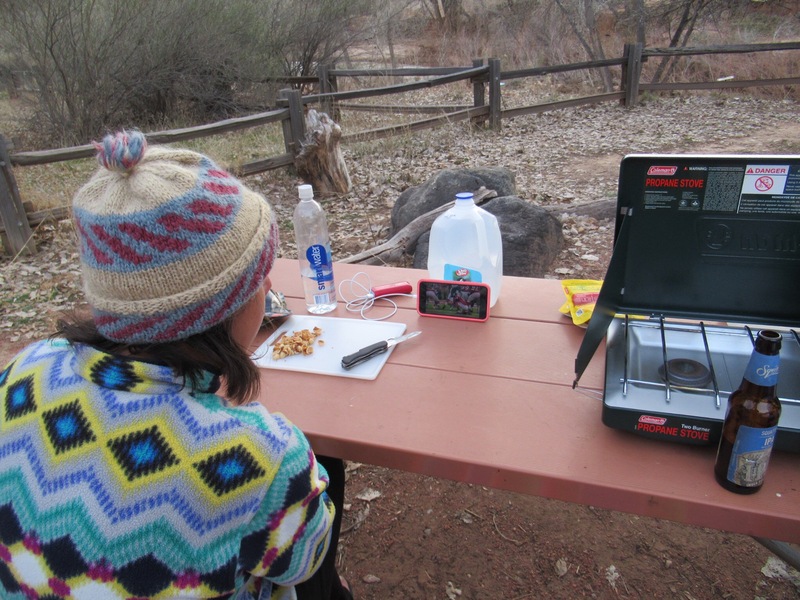 We remembered it wasn’t just Sunday, it was Super Bowl Sunday; and as fate would have it, we actually had data coverage at our campsite and our cell provider was allowing users to stream the game for free. So it was decided, we’d have our own Super Bowl party. It was a bit silly, but we had fun! The next morning we drove out of the park, and spotted some big horn sheep feeding off the side of the road. 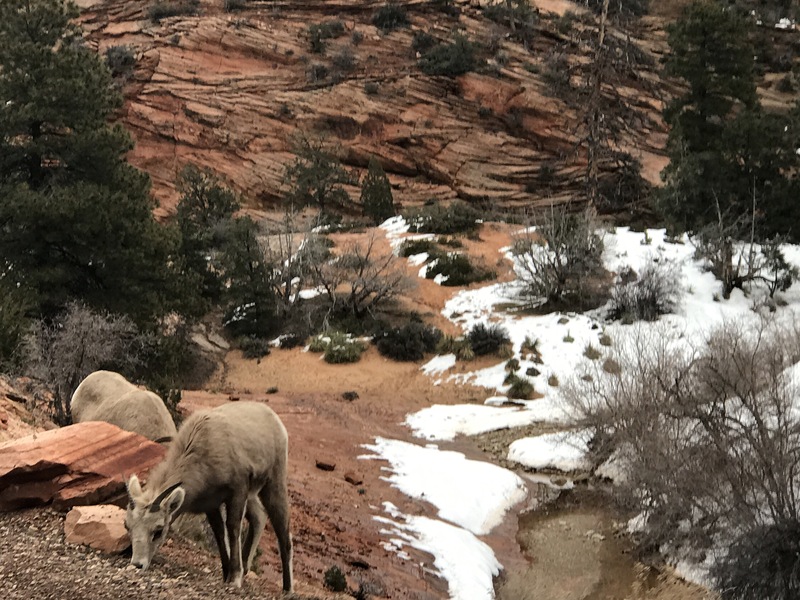 We’ve never seen big horn sheep up close, normally we’re lucky if we can just make them out as little white dots that can be seen on mountain sides. We pulled the car over and watched them for awhile, before leaving them to continue their breakfast, and for us to continue south towards the Grand Canyon.